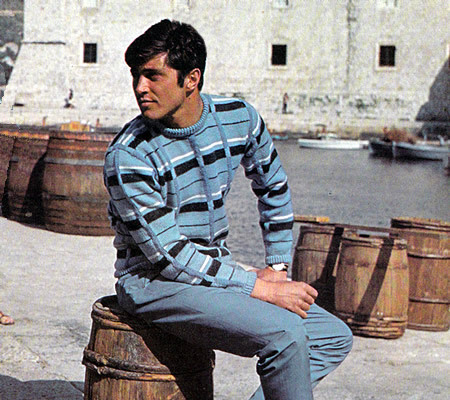 A summer setting with summer colours for this man's sweater in double knitting. Original was knitted in pure wool but there are many cotton blend yarn options in exciting colours that you could use instead. Perfect for that Indian summer. Sweater is worked in intarsia technique using smaller balls of yarn wound onto bobbins. Instructions are given for 3 sizes. With No 10 needles and main shade (M), cast on 114/118/122 stitches, and work 15 rows k1/p1 rib, knitting into the back of the knit stitches on every row to give a twisted rib. Make a hem on the next row by knitting 1 stitch from the needle together with 1 stitch from the cast-on edge all along. Editors note: If you don't want to make this type of hem then just make the ribbed welt as long as you would like (15 rows or shorter - or longer) then do the increase row and start the pattern as below. Next row: purl, increasing 6/8/10 stitches evenly across. 1st row (right side facing): K10 / 11 / 12 M; k4 B; * k20 / 21 / 22 M, k4 B; repeat from * 3 times more, k10 / 11 / 12 M.
2nd row: P10 / 11 / 12 M; p4 B; * p20 / 21 / 22 M, p4 B; repeat from * 3 times more, p10 / 11 / 12 M.
Repeat 1st and 2nd rows 4 times more, then 1st row again. Break M and B yarns. 12th row: P10 / 11 / 12 C; p4 M; * p20 / 21 / 22 C, p4 M; repeat from * 3 times more, p10 / 11 / 12 C.
13th row: K10 / 11 / 12 C; k4 M; * k20 / 21 / 22 C, k4 M; repeat from * 3 times more, k10 / 11 / 12 C.
Break C and M yarns. 21st row: as 1st. row. 24th row: P10 / 11 / 12 W; p4 B; * p20 / 21 / 22 W, p4 B; repeat from * 3 times more, p10 / 11 / 12 W.
25th row: K10 / 11 / 12 W; k4 B; * k20 / 21 / 22 W, k4 B; repeat from * 3 times more, k10 / 11 / 12 W.
Rejoin M, and repeat 2nd then 1st rows in that order 6 times more. 38th row: P10 / 11 / 12 C; p4 B; * p20 / 21 / 22 C, p4 B; repeat from * 3 times more, p10 / 11 / 12 C.
These 38 rows form the pattern. Join in M, and work straight continuing the pattern sequence to the end of the 32nd / 32nd / 36th row of the 3rd pattern. Keeping pattern correct, shape armholes by casting off 5 stitches at the beginning of the next 2 rows, then decrease 1 stitch at the beginning of every row until 100 / 104 / 108 stitches remain. Work straight until back measures 25 / 25½ / 26 inches, ending with right side facing. Shape shoulders by casting off 8 stitches at the beginning of the next 6 rows, then 8 / 10 / 12 stitches at the beginning of the following 2 rows. Leave remaining 36 stitches on a stitch holder. Work as for back from ** to ** . Continue in pattern and work straight until front measures 22 / 22½ / 23 inches, ending with a purl row. Next row: K37 / 39 / 41, turn, and leave remaining stitches on a spare needle. Working on first 37 / 39 / 41 stitches, decrease 1 stitch at the neck edge on every row until 32 / 34 / 36 stitches remain. Work straight until front matches back ending at armhole edge. Shape shoulder by casting off 8 stitches at the beginning of the next and every following alternate row, until 8 / 10 / 12 stitches remain. Work 1 row straight. Cast off. With right side facing, slip centre 26 stitches on a stitch-holder, and rejoin yarn to the remaining 37 / 39 / 41 stitches, work to end. Finish to correspond with first side. With No 10 needles and main shade (M), cast on 60 stitches, and work 15 rows k1/p1 rib, as for back. Next row: Purl, increasing 2 / 4 / 6 stitches evenly across the row. Change to No 8 needles and continue in pattern, joining in lengths of yarn B as required. 1st row: K5 M; k4 B; * k20 / 21 / 22 M, k4 B; repeat from * once more, k5 M.
2nd row: P5 M; p4 B; * p20 / 21 / 22 M, p4 B; repeat from * once more, p5 M.
Repeat 1st and 2nd rows 4 times more, then 1st row again, increasing 1 stitch at each end of next and following 8th row. Next row: P5 C; p4 B; * p20 / 21 / 22 C, p4 B; repeat from * once more, p5 C.
Join in M, and continue in pattern as for back, starting with 1st pattern row, and increasing 1 stitch at each end of every 8th row from last increase until there are 90 / 92 / 94 stitches. Work straight until 7 / 7 / 11 rows have been worked after 3rd W stripe. Keeping pattern correct, shape top by casting off 6 stitches at the beginning of the next 2 rows, then decrease 1 stitch at the beginning of every row until 52 / 48 / 52 remain. Now decrease 1 stitch at each end of every row until 20 / 24 / 24 stitches remain. Press parts lightly under a damp cloth, avoiding ribbing. Work 15 rows in twisted rib as given for welt on back. Join left shoulder and neck ribbing. Fold neck ribbing in half to wrong side and slip-hem lightly in position all round. Join side and sleeve seams; insert sleeves, matching patterns on all seams. 1/1/2 oz in white (W). Pair each of No 8 (4mm) and No 10 (3¼mm) needles. 22sts and 30 rows to four inches on 4mm needles over stocking stitch.